George Graham Reviews Robben Ford's "Truth"
The blues and jazz have been intermixed or decades. Jazz musicians often improvise on blues riffs and chord changes. But many hard-core blues fans say that the hallmark of authentic blues it its musical directness and simplicity. Jazz, on the other hand, thrives on harmonic complexity and general musical sophistication. So, at least as far as electric, guitar-based blues is concerned, there are those who might harbor doubts about the authenticity of blues that brings in jazzy or jazz-rock fusion influence. This week, we have a prime example of the latter which should help to dispel any such doubts. 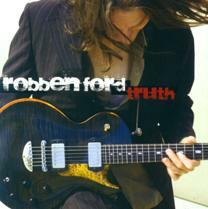 It's the new CD from veteran guitarist Robben Ford, called Truth. Fifty-six year-old guitarist Robben Ford was born in Northern California, into a musical family. His father played country and western music, and his mother was a pianist and vocalist. Robben was the third of four musical sons in the family, and his first instrument was the saxophone, but he took up the guitar by age 13, after he heard blues-rock artists Michael Bloomfield and Elvin Bishop. Living in the San Francisco area, Robben Ford frequently attended shows at the famous Fillmore auditorium, where he saw such performers as Jimi Hendrix, Eric Clapton and B.B. King. But being a sax player, Ford was also drawn to jazz, with Paul Desmond of the Dave Brubeck Quartet being an early favorite, but also extending to Ornette Coleman and Miles Davis. So the blues and jazz have been at the musical center of Robben Ford for most of his life. He played blues in a band with his brothers -- and still does from time to time -- and was also hired at a very young age to tour with Jimmy Witherspoon, with members of what was then his first jazz group. The band was seen by saxophonist Tom Scott who recruited Ford for the L.A. Express, who promptly went on tour, and then recorded with Joni Mitchell. From there, Ford performed with George Harrison on his "Dark Horse" tour. After some time off, Ford began a series of solo recordings, the first of which, The Inside Story, was essentially the first album by The Yellowjackets. At about the same time, he was recruited by Miles Davis and performed with his band for some six months. But in the late 1980s, Ford decided to get back to his blues roots and released Talk to Your Daughter in 1988, to considerable praise. He has been concentrating on his blues-influenced music in a series of albums spanning nearly twenty years. His latest CD continues his mix of straight electric blues with the jazzy sophistication for which he is known, highlighting his crisp virtuosic electric guitar style, and his appealing tenor voice. He is joined on this bi-coastal recording by an interesting collection of guests, including notable jazz organist Larry Goldings, bassist Will Lee, and vocalist Susan Tedeschi. The bulk of the material is original, but there are covers of songs by Otis Redding and Paul Simon. As usual, Ford's guitar work is impressive, and his jazzy tendencies are unmistakable, especially in the original music where the tunes are anything but the standard three-chord blues form. Robben Ford's latest release Truth is another fine album from a versatile guitarist whose career has spanned stints with Miles Davis and Joni Mitchell, to a long stream of solo recordings. The sophisticated, jazzy but electric blues style he established on his first solo blues album in the late 1980s continues, with both the original material and the performances being especially strong. On Truth he surrounds himself with excellent musicians in a lineup that varies from track to track. Sonically, though, the album is not as strong. We'll give it a "B-minus" for sound. The mix, by Dave Way, has a kind of flat, two dimensional quality, without much of a feeling of depth to the recording. The drums, especially, seem to suffer from this. Interestingly, the final track Moonchild Blues, was mixed by a different engineer, Walter New, and it sounds better. And the whole CD was impaired by the all too common excessive volume compression that robs the recording of dynamics, making it all the essentially same volume. If you like your blues on the musically sophisticated side, and you appreciate a first-rate guitar slinger, then Robben Ford's new release Truth is definitely a worthwhile recording.